Language service providers who offer interpretation services are experts at managing projects and hiring professional interpreters in their client's field (legal, business, healthcare, ...). However, they at times need support to navigate technical requirements, and to source the requested technology or additional equipment ressources for larger events. Conference Rental allows language service companies to focus on interpretation and client relationship by taking control of the equipment and technical aspects of the event. Conference interpretation. 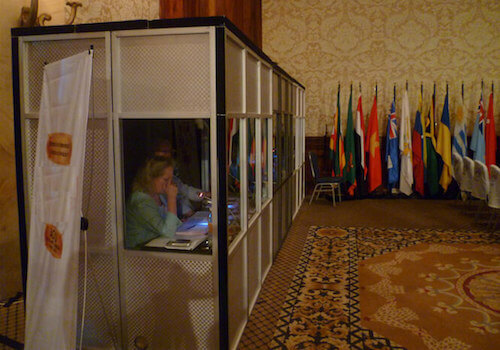 We deliver the complete equipment package to enable simultaneous interpreting for all event sizes up to 31 languages and thousands of attendees: interpreter consoles, ISO-standard interpreter booths, digital infrared language distribution. Portable interpretation: we supply user-friendly portable interpreting equipment delivered in carry cases, using radio-frequency technology with a wide transmission range. More: conference microphones, audio overflow for press rooms, automatic video tracking for streaming, electronic voting, attendee identification, and more. Contact us today to learn more about our services for language service providers and support including bid management, project planning, onsite conference engineers, and more.